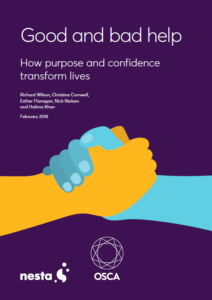 The Good Help Award was launched in February 2018 as part of the release of the Nesta and Osca publication Good and bad help: how purpose and confidence transforms lives. This publication explores the difference between ‘good help’ – that supports people to feel hopeful, identify their own goals and confidently take action – and ‘bad help’ – that undermines people’s confidence, and creates dependency and inaction.Although ‘good help’ is well evidenced and core to how many organisations support people to improve their lives, it is often absent from many mainstream services and social programmes. The Good Help Award was launched to discover examples of good practice across the UK. The award recognises organisations and teams that clearly demonstrate how they are helping people to find their sense of purpose and develop their confidence to take action to transform their lives, rather than focusing on fixing a problem.We received an overwhelming response from over 300 applicants. The standard of applications was extremely high and we had an incredibly difficult job choosing only 19 organisations to progress to the next stage. Reviewing the applications left us feeling inspired by a growing community of organisations that are really making a difference to the way that help is offered across multiple sectors, including health, social care, education, justice and employability.The 19 finalists represent some of the best examples of how Good Help can be offered. Blue Marble Training – Shoreditch Trust. Working with young people whose needs cannot be met by traditional models of education, training and employment, through pastoral support and kitchen-based chef training as they transition into independent living. Body&Soul (You are not Alone). Working to support young people who have attempted suicide by transforming their experience of profound trauma and pain into hope for the future, confidence, and helping young people to find a sense of purpose. Club Soda. Working with people who want to change drinking habits using behaviour change science, supporting people to take their own self-guided journey by providing them with tools, peer support, information and role models. Cornerstone. Working primarily with adults with learning disabilities using a new model of social care designed to ensure the delivery of highly personalised care through a network of up-skilled, self managing neighbourhood teams. Deloitte NI and Kinship Care NI. Helping children and young people in kinship care realise and achieve their full potential and building connections between an often hidden group of carers to form strong, empowering kinship care communities. Foundation for Change. Working with people overcoming drug and alcohol issues using a unique model of education that bridges the gap between people leaving addiction services as ‘addicts’ and leading meaningful and satisfying lives as people. GiveGetGo. Working with people to take the necessary steps to start or return to work by creating encounters between jobseekers and employers to increase the chance of finding employment. Grandmentors. Inspired by the accepting and nurturing relationship between a young person and a grandparent, this programme trains volunteers (aged 50+) to provide mentoring for young people leaving care during their transition into adulthood and independence. Groundswell. Working to address health challenges and inequalities faced by homeless people by training peer advocates with experience of homelessness to help people build trust, knowledge and motivation to use health and care services appropriately. Hackney Pirates. Working with children falling behind at school to make a transformative impact on the literacy, confidence and perseverance of young people so that they can achieve both at school and in the world beyond. Home-Start Warrington. Working to help vulnerable families with multiple needs by offering support in the home to build their confidence, self-reliance and parenting skills to ensure their child has the best start in life. LGBT Foundation. Working with LGBT people who misuse drugs and alcohol, and engage in ChemSex, by utilising person-centred and strength based approaches that support people to reach their full potential and ultimately live safer lives. NHS Community Pain Service and Pain Clinic Plus. Working with people living with pain to provide help that is tailored to the individual to enable them to make meaningful changes and ‘live well’ despite persistent pain. Northumbria Coalition Against Crime (Odysseus Mentoring Project). Providing mentoring support to extremely disadvantaged and vulnerable children and young people, enabling them to have better chances in life and to recognise and reach their full potential. Students & Refugees Together (START). Working in partnership with families, individuals, communities and mainstream organisations to facilitate the transition of refugees from people in need to self-reliant contributors in their local community. Spark Inside (The Hero’s Journey). Working to coach young men aged 15 to 25 in or leaving prison to build their motivation to create a positive future-self, away from crime. Royal British Legion Industries (Lifeworks). Working with veterans of the British armed forces to help them cope with change, rebuild their confidence, gain practical job seeking skills and regain their independence. The Membership Team @Off the Record (Bristol). Working with young people to support their mental health and wellbeing through co-produced activities and access to peer support, psychosocial groups, wellbeing projects and one-to-one support. West London Zone. Working to transform the life chances of disadvantaged children in one of the most deprived and unequal areas in the country through long-term, preventative support tailored to each individual child. For more information about the Good Help awards and the finalists, please refer to the Nesta website.